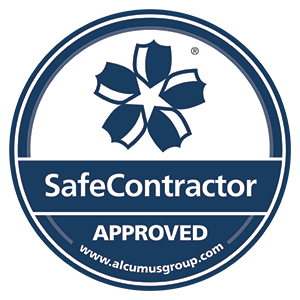 Alcumus SafeContractor is a leading third-party health and safety assessment scheme. It helps to identify which companies meet the UK’s rigorous health and safety standards, offering an accredited contractor register to make it easier to find the right company to work with. Achieving the accreditation demonstrates that we’re taking responsibility for our legal health and safety requirements. To gain the accreditation, we have proved that our health and safety paperwork is up to date and meets legal industry requirements. This includes a health and safety policy, risk assessments, COSHH assessments, construction phase plan, provision and use of work equipment and working at height. Having the SafeContractor seal of approval means that you can be sure that we’re doing all we can to adhere to the very highest standard of health and safety and legal compliance and you don’t have to worry about our team carrying out work on your site. Whatever your needs, you can be sure that we’ll do the best possible job for you. If you’ve got a project in the food industry, get in touch today and see how we can help you.